Toshiba has wrapped up a 12-month test of electric buses equipped with its SCiB batteries, and 44 kW wireless charging system. And as it turns out, medium-size EV buses have potential of reduction of CO2 emissions by up to 60%. The shorter, small-bus was rated at an 40% improvement. The tests were carried out with the cooperation of Waseda University, on a regular service route between All Nippon Airways Co. Ltd. facilities in Kawasaki, and the vicinity of the Haneda Airport in Tokyo from February 2016 to January 2017. 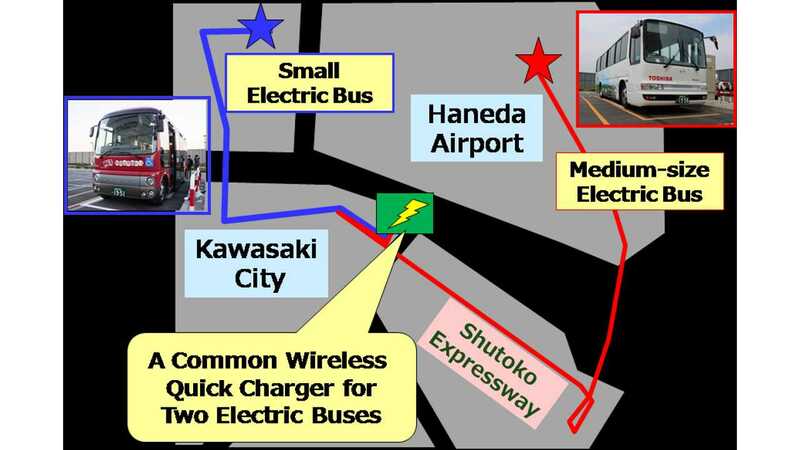 As positive results were proved, we of course hope for more electric buses to be forthcoming from Toshiba. "Recharging was carried out with a magnetic resonance2 system operating in the 85kHz band, the proposed international standard. Magnetic resonance was selected as it is more forgiving than electromagnetic induction3, which requires close alignment and small separation of the charge transmitting and receiving pad. The charge pad in Toshiba’s system can be misaligned by as much 20cm along its width and 10cm along its length, and the two pads can be as far apart as 10cm. 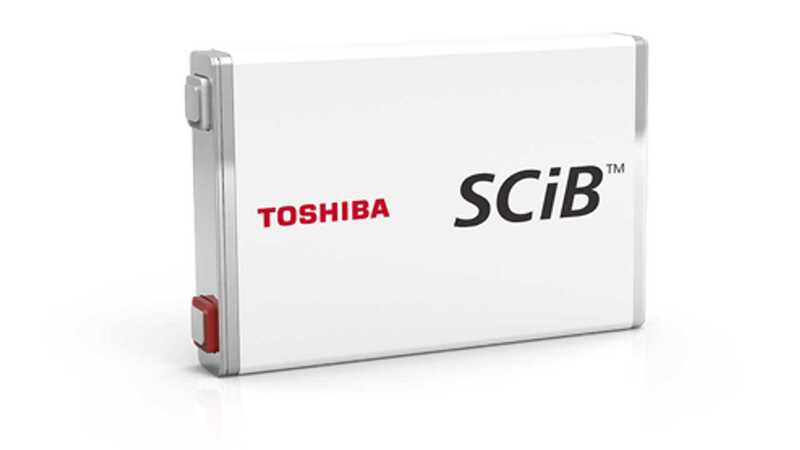 The SCiB™ battery installed in the test electric buses is rugged, reliable and has a long life, showing almost no fall-off in performance even after 15,000 quick charge and discharge cycles. It is highly suited for use on shuttle buses operating at locations such as tourist sites and airports, which must combine heavy use with frequent and fast charging. 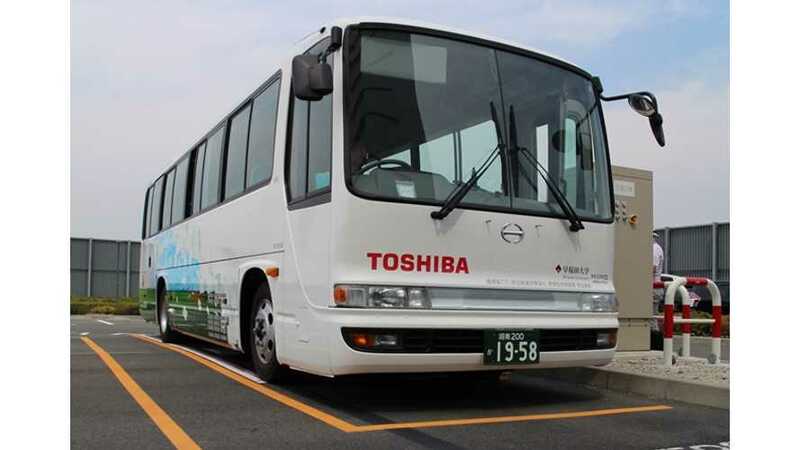 Toshiba also used the project to verify that a light-duty EV equipped with a wireless battery charge receiving pad could be efficiently charged by the same charging system as the bus." Magnetic resonance has a longer power transmission range than electromagnetic induction, realized by utilizing magnetic resonance to equalize the resonant frequency of the transmitting pad and receiving pad, in addition to power transmission by electromagnetic induction.Contactless charging where power is transferred by magnetic fields using magnetic inductive coupling between coils of wire.